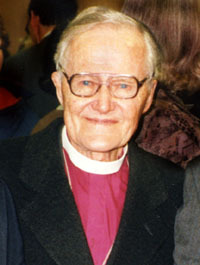 James Edward Lesslie Newbigin was born on December 8, 1909 in Newcastle-on-Tyne, England to Annie Affleck and Edward R. Newbigin, a shipping merchant. His earliest memories were happy ones, with a caring mother and a devout and politically radical father. He attended a Quaker boarding school called Leighton Park in Reding, Berkshire. By the time he headed to Queen’s College, Cambridge in 1928 he had left his religious upbringing but not dismissed it as irrational. In the summer of 1929, at age 19, while serving the unemployed of South Wales, Lesslie’s sleep was blessed with a vision of the Cross that touched the depths of human misery and offered hope. He was quickly drawn into evangelistic and ecumenical relationships and in 1930, at a Student Christian Movement (SCM) gathering in Stanwick, experienced a call to ordained ministry. On completion of his degree, he moved to Glasgow to work as staff secretary for the SCM. He returned to Cambridge in 1933 to train for ministry at Westminster College and in July 1936 he was ordained by the Presbytery of Edinburgh to work as a Church of Scotland missionary stationed in Madras, India. One month later, he married SCM colleague Helen Henderson, and together they set off for India where they lived for decades and together had one son and three daughters.